Trout fishing in Iceland has long been over-shadowed by the highly-regarded salmon fishing. In the early days, trout fishing was not considered worthwhile and so any exploration and development of technique was aimed at salmon. However, as the price of salmon fishing rose, certain fishermen displaced by cost became the pioneers of the trout and char scene in Iceland. To counter the problem of additional price hikes, they kept the marvellous fishing they had found a relative secret. 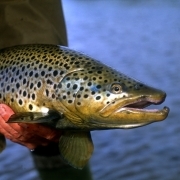 As a result, we are able to offer some outstanding trout fishing at very unassuming prices. 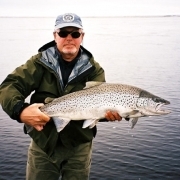 In the north of Iceland, there are a number of rivers that offer incredible trout fishing. As an example, we can arrange fishing on the Litla, Myrakvisl and Laxa in Adaldal. These rivers can be fished for between three and six days and by four to ten rods. There are a number of cosy well-positioned lodges and all can be taken fully or self-catered. The fishing is, as ever, dependent on conditions, and a knowledgeable guide is essential. It is often effective to fish the dry fly but often as small as a number 22 or 24. Tiny nymphs, dead-drifted, also work well. There are many fish also taken on copper bead heads and on streamers. The volcanic rock in this area is sharp on leaders so a fine balance must be struck between abrasion resistance and diameter. 3 to 5-weight rods are best suited to the trout fishing but fishers should also take a 6 or 7-weight rod in case there is the chance of salmon or the wind is very strong. Accessing the area around Husavik is done by flying to Akureyri from Reykjavik. There is then a little more than 45-minute drive. Husavik is a small but lively town which offers abundant whale watching. As such it is well equipped with restaurants and supermarkets as is Akureyri. Land packages are from £1,400 for 4 days.